Thrapsala (Illex coindetti or shortfin squid) are of the same family as calamari but much more cheaper, at least here in Greece, but equally delicious. As I do not find the time to post my recipes immediately, they have been waiting patiently for the right time to be posted, the first one being cooked three years ago. I now have three recipes using Thrapsala (Short-fin Squid). All these recipes are cheap, filling but very delicious. Now that we are going through the period of the Great Lent, I decided that it was about time to post them and I hope to be able to post a few more Lenten recipes before Easter. 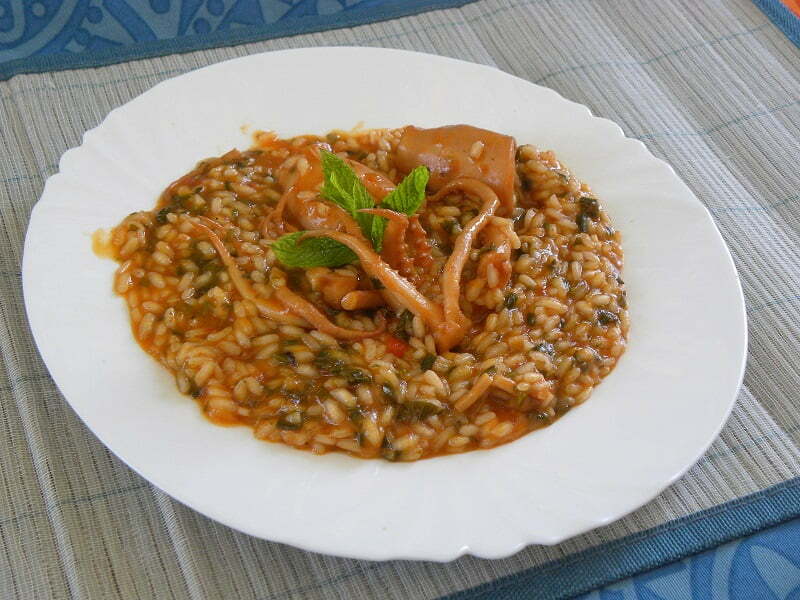 The first recipe is a risotto, combined with aromatic herbs. The risotto is cooked in one pot as these squid were small but if you use calamari, I recommend that your fry the calamari on high heat first, for only two minutes maximum, as otherwise they will become tough and set aside. Then cook the risotto and add the calamari at the end. (If you have never cooked risotto see the link below). 1/2 cup aromatic herbs (I used myronia, parsley and mint) or other herbs such as kafkalithres, oregano, thyme, fennel fronds, dill, chives etc. Clean thrapsala and cut them into smaller pieces (see step by step instructions here). Put them in a bowl with water and 1 tsp baking soda and let them soak for about an hour. Wash them well and drain. In a pot heat the olive oil and sauté the onions until translucent. Add garlic as well as the green spring onion leaves and sauté for a couple of minutes. Add the thrapsala (squid) and sauté for 5 minutes. Add wine and mix until the alcohol evaporates. Add salt, pepper and tomato and tomato paste. Add a little bit of water until thrapsala are covered, cover with lid, lower heat and simmer until soft, for about 20 minutes. Continue as if you are making a risotto. Add rice and continue adding more water, until the rice is cooked, for about 15 – 20 minutes. Five minutes before the end mix in the aromatic herbs. The next recipe is Thrapsala (short-fin squid) stuffed with Black (Cuttlefish Ink) Couscous. It’s based on my recipe for stuffed Calamari with rice but with couscous it’s something totally different and very delicious. Heat half of the olive oil and sauté the onion until translucent. Add the tentacles (half of them chopped into smaller pieces) and sauté for a few minutes. Add the rice, mix until it is wet and add the wine. Wait until the alcohol evaporates and add half of the pureed tomatoes, salt and pepper. Lower heat and simmer until the fluids are absorbed. Mix in the parsley. Stuff the Illex and secure with a toothpick. Add the remaining tentacles as well as the remaining tomato and olive oil on top. Bake in preheated oven to 180oC for half an hour. The turn them over and bake for 10 more minutes. The third recipe is a delicious squid stew with mushrooms. I deglazed the dish with white wine which makes the sauce much lighter but if you like you can use red dry wine as well. Wash and drain the squid. Peel the mushrooms or just wipe them with kitchen paper and cut them into slices. Heat 2 tbsp olive oil in a non stick frying pan and sauté the mushrooms for a few minutes and set aside. Add 2/3 of the remaining olive oil in a wok or other deep frying pan and fry the squid on high heat for a few minutes. Transfer them to a metallic bowl and clean the wok. Add the remaining olive oil and sauté the onion until translucent. Add the garlic and sauté for a couple of minutes. Put the squid back in the wok and add the wine. Cook for a few minutes until the alcohol evaporates. Add the tomato juice, the vegetable bouillon, the bay leaf, rosemary and pepper. Cover the wok with the lid, lower heat and simmer for about 1 hour or until the sauce thickens. When cooked add the mushrooms as well as salt and cook together for a few more minutes. Continue as if you are making a risotto. Add rice and continue adding more water, until the rice is cooked, for about 15 - 20 minutes. Three wonderful recipes! I’d love to try them all (I’ve never cooked squid). My mouth is watering terribly, Ivy. I love esp. that risotto! Thanks for sharing those recipes. I love to try all of it. Thanks for sharing this recipes with us. I will try to cook this delicious food for my family.